How to disable "Booster seats", "Child seats" or "Infant seats"? Go to Admin -> Types of Vehicles -> Edit vehicle type -> Set seat type to “0” -> Save settings. How to increase prices for a particular day (holiday)? To increase prices for a specific date and time eg. New Year , please go to Admin -> Pricing (sidebar menu) -> Holiday Surcharge. Create new entry and set how you would like to modify the price, you can multiply calculated price by some factor or simply add a fix amount to it. Now specify the start and end dates that the price will applied for. You can also to add a message that will be displayed to the customer during the booking process informing him about increase in price. Please note that the end date has to be greater than start date in order to make it work. Currently translations can only be changed from the code level. Here are all necessary steps that are required in order to achieve it. 1. Connect to your server via FTP client eg. Filezilla. You can also use any other software you like. 2. All translation files are located in this path “/eto/resources/lang/“. You can find it in your website main directory. 3. Navigate to one of the available language folders, choose the file you would like to edit and download it onto your computer. 4. To edit the file you will need some kind of editor. You can simply use standard Notepad editor which is available out of the box in Windows or use Atom (free software). 5. Update your translations and save all changes. 6. Re-upload the file to the same location on the server. 7. If everything was done properly your new translations should automatically appear after a browser refresh. Important! All custom changes made in the code will be automatically deleted in case you decide to upgrade the software in the future. We recommend to make a backup of this changes for your future reference. Unfortunately we are not able to teach you how to code, it would require a proper training to learn these skills and we are not a company which provide this type of service. You need to have some kind of programming experience to be able to edit code as it is very easy to break something if you are not sure what you are doing. How to change email template? Currently email template can only be changed from the code level. 2. All email templates files are located in this path “/eto/resources/view/notifications/“. You can find it in your website main directory. 3. Navigate to this folder, choose the file you would like to edit and download it onto your computer. 5. Update your email template and save all changes. 7. If everything was done properly your new email template should automatically appear after a browser refresh. How can I see driver on the map? To see driver current location go to Admin -> Map tab. Drivers who shared their location will be displayed on the map. How can I view all incomplete bookings? To see all incomplete bookings please go to Admin -> Bookings -> All page. Click on the “Filter / Search” button (above listing) to open filter panel and then in status field choose Incomplete option and then press “Search” button. All incomplete bookings will be displayed below the filter panel. How to display a booking report for specific time range? To display a report please go to Admin -> Bookings -> All page. Click on the “Filter / Search” button (above listing) to open search panel and then select time range using “From” and “To” fields. In “Journey date” field please set “Created Date” option and then press search button. All filtered bookings will be displayed below. Now from toolbar above the listing click “Reports” button to see full report. It will be displayed in a popup. Note: You can use any combinations of the filter options to find bookings that you would like to generate a report from. How to set "cash to collect" in driver account? This option applies to cash bookings only and it has to be set manually for each booking in case you would like to instruct the driver how much cash he should collect from customer upon job completion. It is very important to set this option as it is taken into account when generating driver earning report to see how much he owes to company. To set “cash to collect” option please go to Admin -> Bookings -> Edit booking and enter the amount of cash that driver should take from customer. If this option is set to “0” then driver will see in his account that the booking is already paid and there is no need to collect any money from customer. Also once the job is completed and you made sure that driver took the money you need to change payment status for this transaction to paid as it won’t be automatically updated. This is related to all off-online transactions where Cash, Account, BASC payment methods were used. In near future we are planning to make this process more automatic but for now it has to be done manually. How to round prices up or down to the nearest 50p? Go to Admin -> Settings -> Booking -> Round total price option. Choose one of round options and save settings. How to change login password? You can change the password in three different ways. Go to Admin -> Profile (sidebar menu), click edit button, update your password and save changes. Go to Admin -> Users (sidebar menu) -> Select user and edit, update your password and save changes. Use password reset option that is available in login form. How can I add custom code to the booking or customer page? To add custom HTML, JS or CSS code to the <HEAD> or <BODY> section of the booking and customer pages please go to Admin -> Integration -> Add code to the < HEAD / BODY > tag option, insert your custom code in one of these fields and save settings. Please reload your website to see the changes. How to disable any of the seat option? To disable booster, child or infant seat options please go to Admin -> Settings -> Type of Vehicles, edit desired vehicle type. Once you are in edit tab set any of the seat options that you would like to deactivate to “0” and save changes. 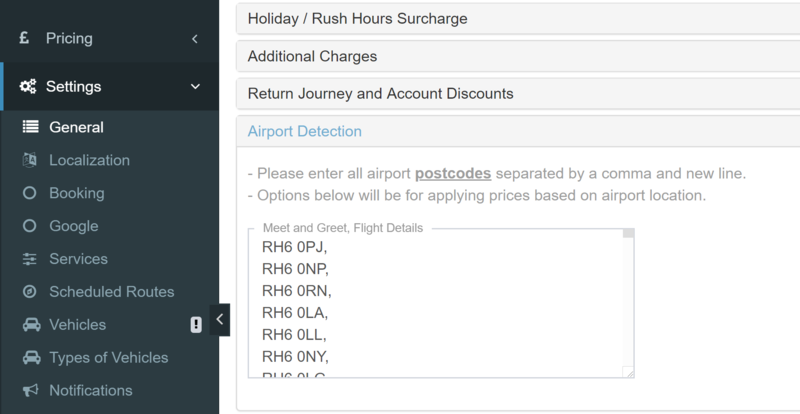 All options that are set to “0” will disappear from the booking page. To enable the same options just set maximum number of seats for each vehicle type and save changes. How to display bank details on the invoice? You can add your company bank details to Company info field that is available in Admin -> Settings -> Invoices. Once the details are updated and setting are saved the info should now appear on the invoice. Why Meet and Greet, Meeting Point and Flight number options are not displaying? First of all please make sure that this options are are enabled in you Admin -> Setting -> Booking tab. “Meet and Greet” option will be displayed in 2nd step of the booking process. “Flight number” and “Meeting point” will be displayed in 3rd step of the booking process. You also need to make sure that airport detection postcode list is set in configuration, without it these options won’t work. The system only accepts postcodes e.g. “E16 2PX”. Addresses e.g. “London City Airport, E16 2PX, UK” won’t be detected. Please see attached screenshot below. 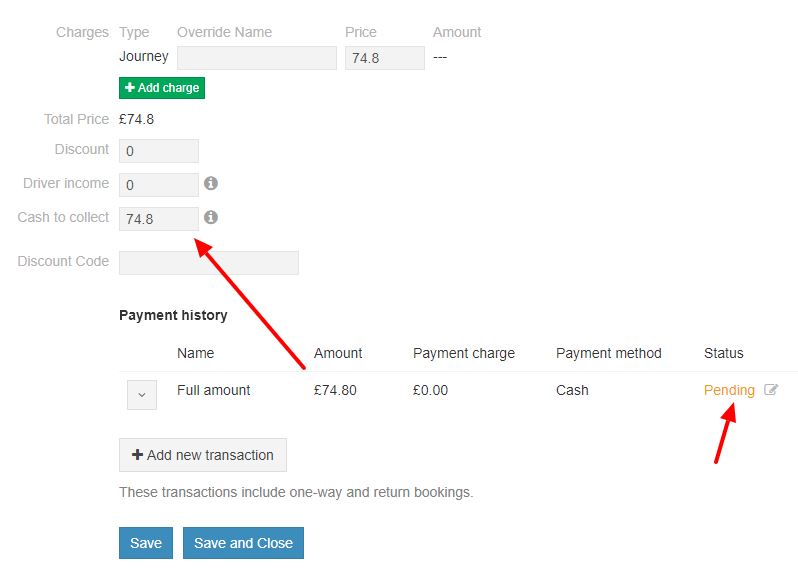 How to display payment method icons in booking form? To enable payment methods icons you must add this CSS code below to Admin -> Settings -> Styles -> Custom CSS field and save settings. Why parking charge is not applied? Please make sure that you have correctly set up parking charge in Admin -> Pricing -> Parking charge tab. When you enter addresses in locations section please use full address to properly geocode it e.g. instead of “Gatwick, UK” use “Horley, Gatwick RH6 0PJ, UK”. How to select return vehicle on mobile? Due to limited display space on mobile devices, vehicle type option (second step of the booking process) is displayed on tabs instead of side by side boxes. 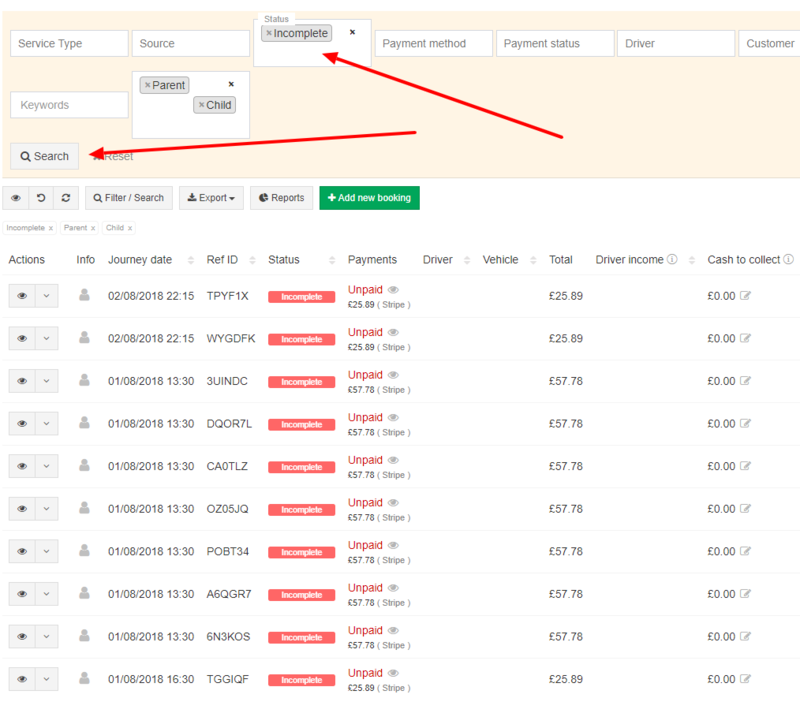 To choose vehicle for each journey you must switch between “Outbound” and “Return” tabs which are displayed just before vehicle list (at the top). Please note that if you have set default vehicle option in Admin -> Settings -> Types of Vehicles page then this vehicle will automatically be selected by default. This way you can suggest to your customers to book this type of vehicle. When this option is enabled and customer chooses return journey then return vehicle will automatically be set to default one. If default vehicle is not set customer will have to choose both vehicles in order to see the price, a warning message will be displayed in this case “Please choose vehicle”. Why this error "The route could not be found" is coming up? If you see this error message “The route could not be found, please enter full address.” please check the following. Make sure Google Service integration is valid, here is a tutorial showing how to set it up. The problem might be that the billing profile is not set in your Google Developer account (see step 5) or Google API keys are invalid. Because of that the system won’t work properly and the distance between locations cannot be calculated which results in incorrect price. Make sure that location suggestions are set correctly in Admin -> Settings -> Locations tab. You should be using full addresses to help Google properly geocode it and get right postcode which is use for applying fixed prices. Example, instead of “Heathrow Terminal 5” it should be “Heathrow Terminal 5, TW6 2GA, UK”. How to send driver and vehicle details to customer? To send driver and vehicle details to customer please make sure the following options are set correctly. 1. Driver and vehicle profile is completed. 2. Driver and vehicle are assigned to the booking. 3. Make sure that options “Job Accepted” or “On Route” in Admin -> Settings -> Notifications tab are enabled for customer. When the booking status changes to one of these two statuses, driver and vehicles details will be automatically send to customer. In case you would like to resend the notification you need to go to edit booking tab and in “Notifications” section tick the option “Send notification” and change to status to one of the above depending which one you activated and then save it. If everything was done correctly customer should now receive the notification. How to activate SSL certificate? SSL certificate (https://) is used to secure your website data transfer, it encode all information exchanged between browser and server. Having SSL enabled might give your users extra confidence that they information are processed in a secure way everytime when they enter their personal information or make an online payment. To enable SSL in your website you need contact your current hosting provider and ask them to install it for you. Once this is done you can now force booking system to use only secure connection. This can be activated in Admin -> Settings -> Integration -> Force HTTPS (Secure) connection option. Why I company number or VAT number is not displaying in invoice? Please check if company number and VAT number are set in setting tab correctly. Company registration number can be set in Settings -> General -> Company registration number field. Company VAT number can be set in Settings -> Tax -> Company VAT number field. Please note that if you have set any text in the field Settings -> Invoices -> Company info then auto generated company information e.g. “Company name, number, address, VAT number” etc. will not be displayed as this option overrides these settings and you will have to add it manually within this option if you want to display them to customer.